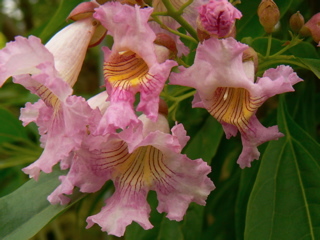 This is an intergeneric hybrid ( a cross between two genus) of Catalpa bignonoides (the indian bean tree) and Chilopsis linearis (desert willow). They are closely related and both come from North America but come from different regions; Catalpa from moist areas of the south east and Chilopsis from the arid areas of the southwest and parts of Mexico. Catalpa is not particularly tolerant to frost, but this hybrid is. This year, I presume due to the intense heat we have experienced in July, it has put on a wonderful show of large pinky lilac blooms with an attractive yellowy stripe inside the bloom.